Join in with our 150th Birthday Celebrations by signing your school up to Get Colourful! Celebrate Evelina London's 150th Birthday by taking on Challenge 150! What will your 150th fundraising challenge be? 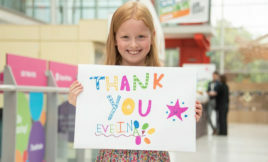 Discover how your donations have made a difference at Evelina London. Because donations help fund life-saving equipment, life-changing research and better facilities – above and beyond what the NHS can provide. Because we want to provide the little comforts that make hospital less scary for our youngest and most anxious patients. Because we can make a difference to thousands of young lives. Leaving a gift in your will to Evelina London is easy to arrange, will not cost anything now and is a wonderful way to give back. Keep up-to-date with news from Evelina London and Guy's and St Thomas', ways to support us, and events you can sign up to in order to help fundraise for our hospitals.